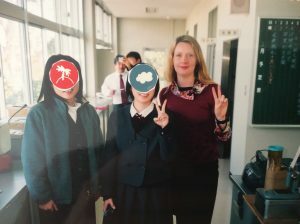 It has been 11 years since my official last day as an ALT in Nakatsu City in Oita Prefecture, Kyushu, my Japanese furusato — my former second home. The teachers had escorted me out into the carpark and waved me off, as is customary. In September 2018, I went back, and it was surreal to be once again at the school where I spent three years that changed the course of my life. This time, I was not a single woman in my twenties, looking for adventure, wanting to learn the language and immerse myself in the culture. I was on a family holiday with my partner Ian and our 2-year-old son Daniel. I wasn’t on the receiving end of any “kawaii“s this time (cute!) — they all went to my big-eyed, blond toddler. I was no longer a person in my own right, I was just the mother trailing behind that cute, doll-like boy (“ningyo mitai!”). This was the first time I had been back to the school officially since I left. I had driven past on a couple of occasions, but thanks to the wonders of Facebook, the three of us were welcomed for an official visit by Alex Furukawa, the current ALT there. We had tea with the kocho sensei (principal) and made small talk. I realised to my embarrassment that I didn’t know the name of the kocho senseis and kyoto senseis from my day – I had just known them by their titles. I even got to meet a former student, Keiko*, who is now an English teacher there. I didn’t like Nakatsu when I first arrived. It was midsummer, and I was struck by strange smells, and creeped out by the sight of crabs crawling along the drains on the side of the street. I envied my friend who’d been placed in Osaka, a far more exciting new home with its nightlife, fashion and familiar coffee chains. Nakatsu was neither quaint country village nor thriving metropolis. It was a mini concrete jungle. The juugosen, the main artery in town, was dotted with car dealers and fast food joints. To make matters worse, the role of ALT at my base school was fairly restricted. I only taught five communication classes a week, and made a few guest appearances where I read out the week’s vocabulary (the dreaded “human tape recorder”). At my second school, I had a few more classes, but I still spent a lot of time sitting at my desk feeling sorry for myself. I also had a bad case of culture shock – they should call it a cultural tsunami. I had to question every assumption I have ever made. You know how you get extra tired when you start a new job? It was like starting a new job every day for a year. I fumbled with opening jars, chip packets and bottles, flushing toilets, opening doors, switching on lights, sitting in a restaurant (on the floor), whether doors go in or out. Every day was exhausting. But things changed when I was asked to tutor a senior high student one hour a week after school. He was going to a college in the States in March and an English teacher asked me to help with his conversational English. Keita was extremely shy at first, and I felt a sense of responsibility to make sure he didn’t wind up alone and mute on campus. By the time he graduated, I was no longer worried. He was speaking with confidence and gave me a nice note thanking me for teaching him. For the first time, I felt like I was really teaching, and I was able to apply the ESL theory I had studied on the CELTA course I took back in Sydney. Keita’s excitement about his study plans was also contagious. He was going to study palaeontology in Colorado, an area known for its fossil remains. “It’s so INTERESTING,” he would say. Witnessing his enthusiasm for his upcoming overseas adventure, I realised that I was wasting mine. For months I’d been in reactive mode, to cultural differences, social circles and physical challenges. I realised that learning Japanese was so INTERESTING. Being around the students at my two schools had a big impact. Seeing them apply themselves so hard to their studies inspired me to apply myself to my Japanese study. I saw kanji on everything from food packaging to safety warnings and school circulars. While at first their inscrutability was frustrating, I developed a curiosity that kept me going back to the textbooks. I set myself the challenge of taking the JLPT, and later the kanji kentei. I made my own kanji cards, drawing them on little flip cards from the 100 yen shop. I plastered vocabulary lists all over the walls in my apartment including the toilet and shower, for maximum exposure. It was then that I first noticed that some kanji that shared a certain component also had the same ON reading. 青 SEI is a famous example, appearing in all these kanji that have the ON reading SEI 清 (clear)　請(ask)　静 (quiet). I asked my sempai JETs if there was a list of these components and the kanji they appeared in, but the answer I kept getting was frustrating: there is no list, you just have to learn them. I didn’t accept that response and one spring vacation when I had no lessons but still had to be at school I sat down with a two-page print-out of the Joyo kanji listed in ON reading order, and several highlighter pens. 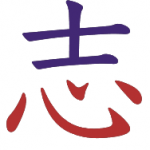 I used different colours to mark kanji that were listed close together and shared a component or a visual look. I cut them out and pasted them onto cards, adding my own codes for the endings of the sounds, such as long (SHUU, SHOU) short (SHI, KA), inflected (EI, AI) and rounded (KAN, SHIN, EN). I tried to classify them in as much detail as I could. After I had completed this exercise, I had a newfound understanding of the relationship between form and sound in kanji. For example, I realised that 可 was linked to the ON reading KA in 可 (can/passable), 河 (river) and 歌 (sing). As a visual learner, this was crucial to my Japanese level improving. 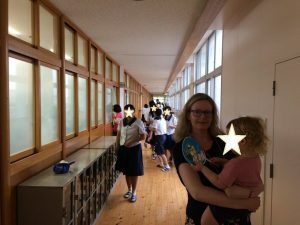 I became much better at guessing the ON readings of new kanji I encountered, which meant I spent less time with my head in a dictionary, and more time reading real texts. Armed with this knowledge, I was able to pass the kanji section of the JLPT Level 1 within a year. Learning to read in Japanese gave me a sense of deja vu – from when I was five years old and first learnt the English alphabet. The sense of wonderment was the same: as the world around you goes from blurry to sharp relief, and you go from feeling confused and dependent to informed and independent. The feeling was addictive, and my kanji obsession grew from there. 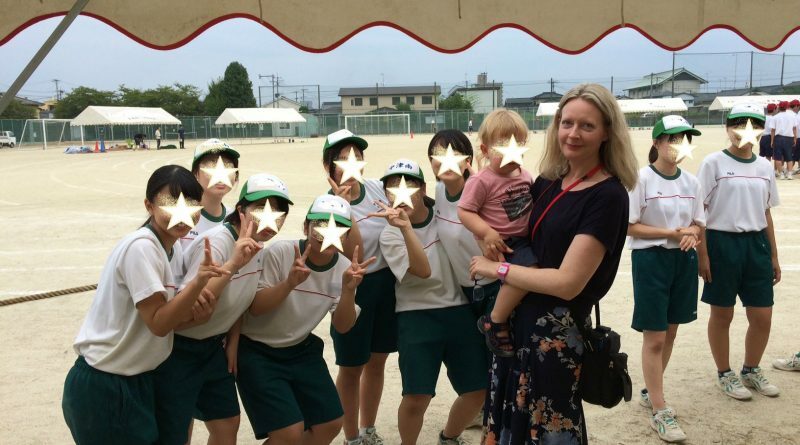 The better my Japanese got, the more I was able to take part in end of term enkais and feel like one of the “normal” teachers. By staying at the school for three years I showed the teachers that I was committed, and they returned the favour by giving me more respect and responsibility. Coming to Nakatsu set in train a series events which helped me discover my love of Japanese and teaching. 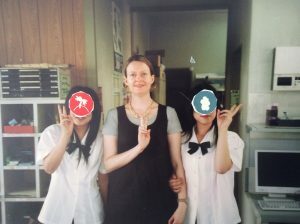 After I left JET, I enrolled in a Master of Translation and I have since worked as a translator, eLearning writer and university lecturer. Showing Nakatsu to Ian and Daniel was really important to me. It was like showing them a part of me. We met up with some Japanese friends, and drove around Kyushu. Ian was impressed with the beautiful scenery, fascinating history and friendly people. Daniel loved onsen and has since suggested we go again. He also liked lining up our slippers at the hotel’s genkan. We still use the word now for the area near the front door. Going back to the school where I had so many pivotal experiences was surprisingly emotional. While it had changed in some surface ways, in other ways it was exactly the same. It felt like I had been transported back in time 14 years, and all those conflicting emotions came flooding back. It was overwhelming to relive the feelings of culture shock and dislike, followed by acceptance and joy. I returned to Sydney feeling like a part of me that had been long lost had returned. * All student names have been changed to protect anonymity. Natalie Hamilton is a writer, translator and lecturer in Translation Technology. She has a Master of Japanese Translation and is NAATI-Certified in Australia for professional translation from Japanese to English. She has translated academic papers and corporate content for companies including Fujitsu, MUJI and Sony. She previously wrote online content and elearning materials for global corporations. 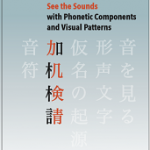 Her new book The Kanji Code: See the Sounds with Phonetic Components and Visual Patterns teaches a systematic way of learning the ON readings of kanji.